Bibliomancer Comments: Stop changing your mind and put your metal bra on. We’ll be late for the party. Okay.I get the red ’cause it’s like Mars and all, but after, uh what? Gosh, how did science~fiction not become the dominant…oh screw it. This is just way weird and sorta creepy. I feel as if, if I were reading that on the trolley, people would come up to me, take it out of my hands, take a long look at the cover, shake their heads and hand it back. 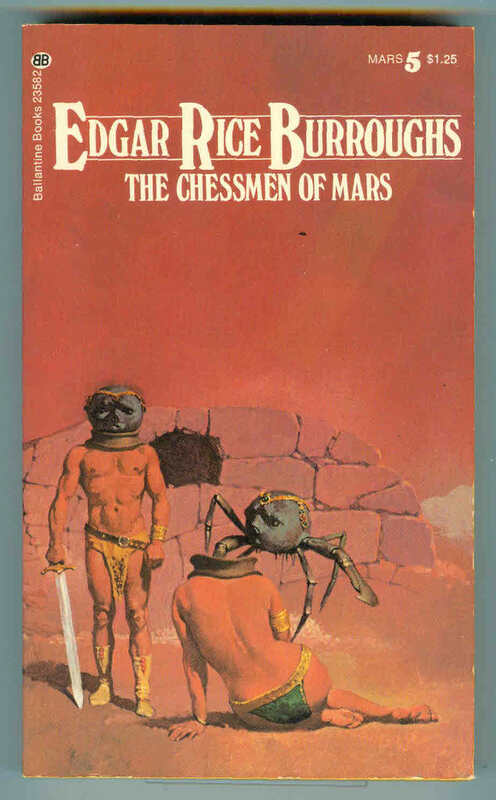 I misread this title as The Cheesemen of Mars. Boik. How tiny is that man! Very that’s how! The population of Mars is going drop drastically unless they can find paper bags big enought to cover those heads. Man, if ‘John Carter’ had been more like this cover it would have been… well, it would have been different. Those heads seem to fit exactly into the cavity in the wall behind them. Don’t know what this means, just noticing. Leads to some nice visualization at least. I also love the fact that there’s a “detachable head” tag. Wiz, you never fail to impress me! The spider on the right has something of the Rodney Bewes about him. It’s kinda half a very creepy (in a good way) cover and half a silly one: a good idea badly expressed. Apparently the cover does reflect the book, see: http://en.wikipedia.org/wiki/Kaldane a neat SF idea. This is exactly what happens in the book and kudos to the artist for making this look so horrific! It’s like Edgar Rice Burroughs… on acid! Nitty Nora used to warn us about head-lice, but if she’d shown us this picture we’d’ve listened. @A.R. Yngveâ€”maybe a bit too much of that absinthe? The interesting thing about this cover is that when I was a kid in a small Manitoba town they had this complete series in the sci-fi section (basically two shelves). This was the first one I really noticed. Over the last couple of years I have been trying to collect the whole series in this particular run of the ERB classic stories. The covers were all drawn by Gino D’Achille. Weird. I love the Gino D’Achille covers for this series. Can’t agree on this choice at all. Rush Limbaugh was very pleased with his new body. @A.R.Yngve19â€”yes, but which is which?